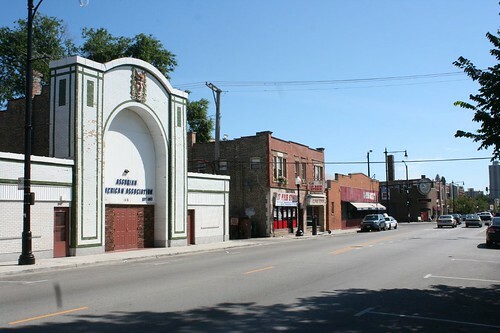 Two of Chicago’s earliest surviving movie theaters – the Park Manor Theater and the New Devon Theater – were built in a similar material palette, a common scheme of white glazed brick with dark green glazed brick trim. It’s an often-seen style from the years just before World War I. I will cover it more expansively in a later post; however, in the process of researching these two, I came across so much info that it seemed fair to give them their own separate writeup. Both were relatively small houses, running what the Tribune referred to as “photo plays”. They were built at the declining end of the nickelodeon era, when features were short, admission was five cents, and “talkies” were still over a decade away. These smaller theaters often could not compete against the much larger movie palaces which began appearing only a few years later, though some stayed in business into the 1950s or later. In Rogers Park, the short-lived New Devon Theater, 1618 W. Devon Avenue, was built in 1912 (previously covered in this post.) Among its earliest listings were the photoplay The Diamond from the Sky, a drama hyped with a full-page ad in the Tribune. The New Devon only lasted a few years as a theater, and housed a series of businesses in the following decades. The first was a Ford auto dealership in the 1920s, the Hughey Motor Company. In 1941 it housed the Rogers Park chapter of America First, an anti-war group which had trouble finding lodgings in the area due to landlords’ fear of being seen as pro-peace while war raged in Europe. The group had been summarily kicked out of another meeting space after only a few weeks of occupancy, no reasons given. By 1952, it appears to have been home to Devon-Clark Radio, which changed to Devon-Clark Television by 1954, an electronics store selling Westinghouse electronics, air conditioners (“Sleep in an ice cube on hot muggy nights”, only $2.66 a week!) and other goods – though some ads list the address as 1612 Devon, a different building entirely. Want to give them a call to check? The number is Ambassador 2-3081. 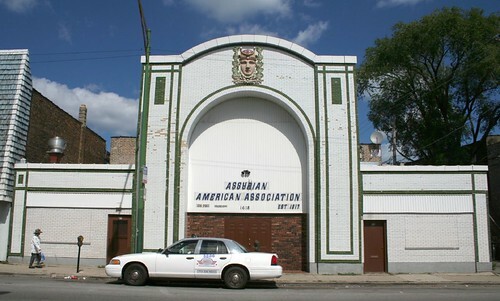 The former New Devon Theatre has been the Assyrian American Association since 1963. The one-time competitor that put it out of business, the Ellantee Theater, is visible just down the street and today houses Clark-Devon Hardware. 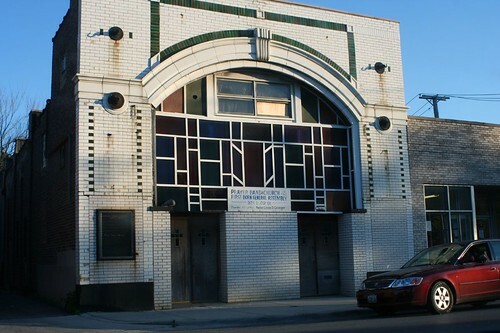 On the south side, the old Park Manor Theater, 321 E. 69th Street, opened in early 1914 and lasted till 1950 as a theater. Its early screenings in 1914 included serials such as The Adventures of Kathlyn (also showing at the New Devon). A Tribune listing notes the theater among contributors to relief funds in the wake of the Eastland disaster on the Chicago River in 1915; the theater commonly ran the Selig-Tribune newsreel (“The World’s Greatest News-Film”, according to their ads; again, also showing at the New Devon). A 1970 column and response letter sees old residents of the neighborhood reminiscing about their childhoods, with the Park Manor’s nickel-a-show serials and Punch and Judy shows figuring prominently. 378 seats, fully equipped, including $800 popcorn machine; lobby and front need painting, a few seats need repair, otherwise in first class condition. Oil heat, washed air heating and cooling system, double Western Electric sound, new projector head, new strong low intensity arc lamps, rectifiers and Martin converter, new screen…rent $150 per month…a real opportunity for the right party. Alas, the $800 popcorn machine would not see service here again; the building was home to the Philadelpha Church by 1961, followed by the Grace Eden Church – both African-American congregations, ironically (or perhaps fittingly) enough. At some point during this era, it gained a low-budget but funky Midcentury colored window across its entrance. In 1961 it served as a back-up site for a “mixed revival” – a racially integrated prayer rally – which was disrupted by mob violence and broken up by police at its original location at the Ogden Theater, ostensibly on grounds of the building being unsafe. Threatened by demolition in 1967, it nonetheless has survived to the present, currently housing the First Born General Assembly Church. 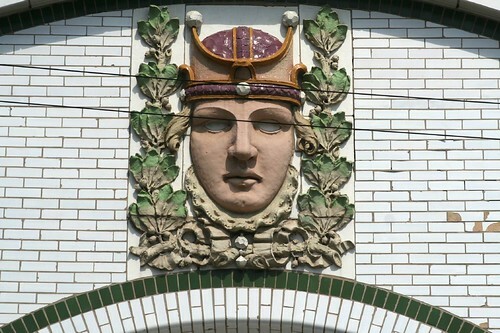 This entry was posted in Bakery Brick, Devon Avenue, theaters, Vernacular architecture, White & Green Glazed Brick Storefronts. Bookmark the permalink.